Presenting to you The Avengers Hawkeye Leather Vest! Hollywood’s blockbuster Marvel’s The Avengers showed up the team of superheroes as the avengers of the world. One of those superheroes, Clint Barton / Hawkeye (reprised by famous Hollywood celebrity Jeremy Renner) carried this stylish vest costume that reinforced his character throughout the movie. The Avengers Hawkeye Leather Vest has a fully zipped closure with intricate panel detail over the shoulder and at the abdomen reinforcing your overall looks. This vest is crafted with professional technique and outstanding finesse that makes you feel on to the top of the world. 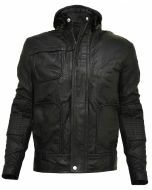 Made from excellent quality leather, the jacket is colored in deep black and brown that is classy in appearance. The polyester lining of the vest makes you feel heavenly, where as the bold symbol on the chest gives a powerful impact. Jazz up with front zip closure, ban collar, 1 pocket inside, stylish front and stunning look.